I thought I'd share a few beauty hacks as I know how expensive things can be! I hope this post is helpful. Leave a comment if you have any hacks you swear by. 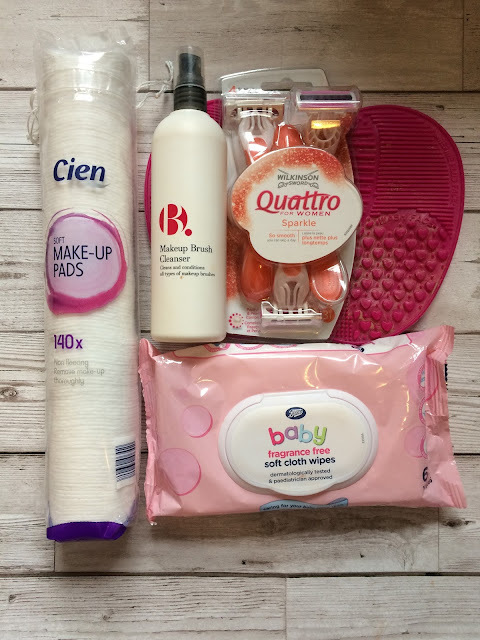 1.You don't need to buy expensive cotton pads to remove makeup ever since a Lidl opened up in my town I decided to their beauty range and have been impressed. The good thing is they're only 42p! If you don't have a Lidl Primark have some cheap pads for 50p. 2.Cotton buds dipped in micellar water to remove mascara/eyeshadow smudges. 3.Use makeup brush cleaner (FYI you don't need to spend loads!) or a baby shampoo to clean your makeup brushes/blenders. I clean mine on a rubber cleaning mat which I got online and then lay on a towel to dry. 4.Baby wipes make good alternatives to makeup ones as they're much cheaper than actual makeup wipes although I do tend to buy simple micellar wipes when they're on offer. If not then I buy baby wipes from Lidl for 49p. 5.Storage pots for brushes I got mine from B&M but you can use anything such as a old candle holder cleaned out or a mug you don't drink from. 6. Have a sort out of your makeup get rid off the old,give away things that you haven't used to friends/family. 7.Wipe your mascara around the rim with baby wipes this will get rid of bacteria, you can also wipe your eyeshadow palette to get rid off any excess. 8.Use a anti bac wipe to clean out your makeup bag this will help keep it fresh and get rid off any dirt and grime. Some can be machine washed but check the label!. 9.Keep your makeup out of the sun try to store it in a drawer or in a basket away from direct sunlight as it will get hot and melt. 10.Label products with the date you got them so you know how long you've had them. 11.You don't need to spend loads on razors try to look out for the cheaper ones or look for offers. I do sometimes buy the venus ones when they're at least half price but I never buy refills because they are ridiculously expensive!.